Film archiving is a rapidly changing field as a result of the accelerating development of online digital technologies. Taking as its case study the example of SP-ARK (1), the Sally Potter online film archive, this article proposes a notable shift from the traditional single-user archive model to emerging multi-user, collaborative forms of archival scholarship. The digital preservation and presentation of archival materials dramatically impact upon the nature of the types and levels of access to primary film materials and their associated ephemera that are afforded. Moreover, the nature of the discoveries, insights and findings that can be made through online digital interfaces are radically altered. In what follows, I will explore the SP-ARK model, both through close analysis of the archive itself, and also through an empirical user study of students who access the archive for their studies. I will argue for a re-thinking of archival process design and will contend that, in an ever-shifting digital landscape, the archival planning for future feature-film projects might be usefully considered at the earliest stages of the production. This disconnect – perhaps we call it an ‘A/V gap’ – is largely a function of attitudes and behaviours within teaching, production, and publishing. It is also an outcome of the paucity of high quality audiovisual work now available for educators. As we note in our 2010 Film & Sound Think Tank film, Knowledge Is…, (7) despite the leading investments of JISC and others worldwide, only 5% of our audiovisual history is digitized and available to educators and the public online (2011: 3). The recent film review undertaken by the Department of Media, Culture and Sport (DCMS) in the UK also supports this view. It concludes: ‘The percentage of material readily accessible by the public in National and Regional Archives remains very small in proportion to the size of the collections. Most of the film material held in archives around the UK is owned by rights-holders who understandably will only make their material available in a way that is consistent with their commercial interests’ (DCMS, 2012). In addition to those archives listed above (BFI, BOB, EU Screen, Europeana, Regional Film Archives), there are a very limited number of repositories that house the culturally rich resources of fictional filmmaking across the globe. In the UK, the only known openly accessible online version of such an archive is SP-ARK. Internationally, in Japan the entire archive of prolific Director Akira Kurosawa has been uploaded and is freely available to view, access and download online, but is only currently available in the Japanese language. (8) These exemplars are invaluable and enriching resources for film education, since in their exposure of all the materials related to a film production (photographs, video assist footage, casting recordings, scripts, storyboards and developmental paperwork) they reveal the often hidden creative practices of fictional filmmaking. As Mayer contends in relation to SP-ARK, ‘It reflects the dailiness of labour involved in filmmaking as opposed to the heroic narrative portrayed in mainstream films’ (2008: 201). Within educational contexts, access to such primary resources facilitates close textual analysis and in-depth examination of films – learning practices that could not be achieved without such access. Such resources also have the potential to provide unique and unprecedented sites for communication, collaboration and the establishment of both online and physical networks. As the DCMS report highlighted, it is the key issue of licensing that appears to be foreclosing the development of open access to film and cinema resources. Although this continues to be a problem, fortunately it has not been so for the case of SP-ARK, since the copyright to all of the materials in this archive belongs to Sally Potter and her production company Adventure Pictures (AP). They have chosen to allow access and use of the materials via a Creative Commons licensing model (more specifically the materials are made available through a BY-NC-ND (9) license). 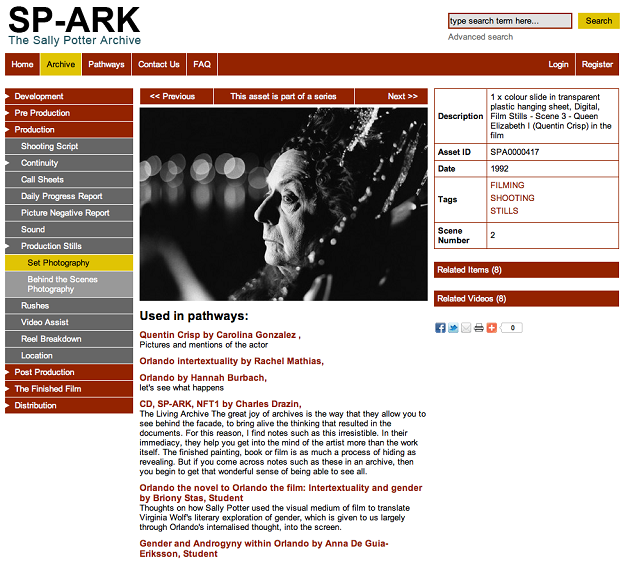 SP-ARK is an interactive online project based on the multi-media archive of world-renowned filmmaker Sally Potter. Potter’s work features across the curriculum and syllabus of many university courses, both in the UK and abroad, in relation to the subject areas of film, media and literature. Potter herself is a key figure of study within these disciplines (see Appendix 1 for a list of her films, see also Mayer [2008, 2009] and Fowler .). The prototype pictured in Figure 1 included access to 600 archival items from the film Orlando (1992). The SP-ARK website was built and hosted using the WordPress content management software system. It facilitated the navigation of the archive via its pioneering ‘pathways’ feature, which meshed the principles and practices of blogging with archival browsing. This built on the idea of adding value and provenance to the materials by using social networking to enable users to talk to one another about what they discovered. Users were able to build their own unique ‘pathway’ through the archive’s content as they explored a particular theme or process, and they were able to save items that they had viewed. 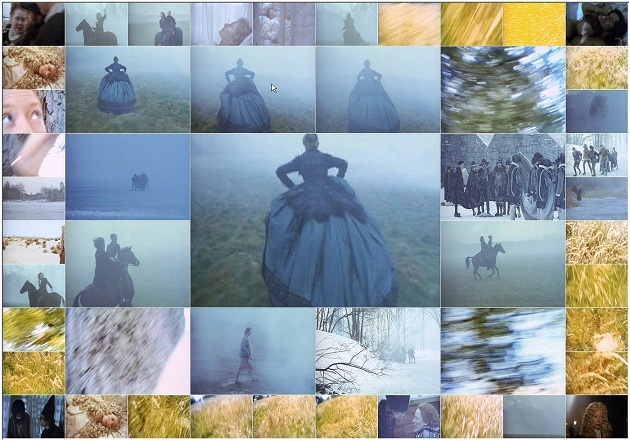 In February 2012, after an extended period of development and the archiving of further materials from the film Orlando, the latest version of SP-ARK was released to include a revolutionary ‘Visual Browser’ (which, for the first time in a film archive, allows users to visually analyse the film’s original rushes, from single frames to complete shots, and incorporate these in their pathways – see Figure 4; see here for a short video that sets out the new features), (13) social network integration (Facebook, Twitter etc), the pathways tool, and access to over 4000 assets. Users are able to view clips from the film as well as a myriad of associated materials including the scripts, storyboards, still images, location and developmental paperwork. Figure 2: Multiple levels of browsing the archive: From left to right – The Production Process Taxonomy, ‘Used in pathways’ links, Search Field, Tags and Related Items/Videos. The current version of SP-ARK has deployed standard web development and is built in the WordPress programming language PHP. It is a bespoke development (as is it is not based on any other technology) and uses the open source MySQL database managing system. The archive’s descriptive information (texts, tags, asset descriptions) is all held in this database and the assets are handled as ‘flat files’. (14) User information (name, institution, email address – which are generated when a user requests a login to the site), and user pathways are also stored in the database. The site supports multiple levels of browsing and searching which are all accessible without a login to the site. (The login enables users to create pathways and to message other users). Users are able to access materials through a taxonomy-led approach (15) through advanced text search fields, the assignment to each asset of a number of descriptive one-word tags, (16) related material links (see Figure 3), the pathways and the Visual Browser (see Figures 4 and 5). Once an archive asset is opened, users are then able to continue browsing the archive in a non-linear and exploratory fashion by clicking on the links to the asset’s ‘related items’ (every SP-ARK item is linked to other associated items). For example, a page of film script is linked to a corresponding film clip, which could then be linked to a call sheet, a continuity report, production design images, location notes etc. In order to explore user interactions with the archive within an educational context, I conducted a focus group with a class of 20 year-2 undergraduate US-based Film Studies students who were undertaking an assignment that involved exploring the nature of the archive within the context of the Film and Digital Age. The focus group transcript was coded into five key themes that emerged throughout the open discussion. Students were asked to highlight and discuss the positive and negative aspects of SP-ARK that they encountered whilst undertaking their assignments. The key themes identified were: the digital archive model; interpretation; openness; accessibility; and social learning. Findings are summarized below. Students immediately began to discuss issues around the navigation of the archive as they had the task of finding one particular asset that inspired them. [Student] We started going through personal notes and going through the written part of it, and that got really interesting because you started seeing it in a different way, rather than just watching it visually. I don’t know, it just brought it to a different level. The students clearly expressed a passion for being able to explore the film of Orlando in this way. [Student] In comparison to like a physical archive, was the amount of ways that everything was organized […] I just like that you found overlap a lot easier, whereas if you’re looking at things physically, it would take a lot of effort to actually find how everything overlapped. This observation regarding the organizational structure of the archive illustrates SP-ARK’s intentional interface design as I have outlined it. [Student] I felt if I was in a physical archive, I wouldn’t be able to keep referring back to what the final product looked like. Students had previously attended a seminar led by the British Film Institute, and so had a clear understanding of the nature and limitations of access within physical film archives. [Student] Now becoming involved with the visual information, it’s no longer just going onto JSTOR [academic platform] and reading an article, but we’re actually really seeing the clip from the film, from an out-take. Students also clearly appreciated the ability to refer back to the source material as they correlated and contrasted the different sources. [Student] I think we just got really excited actually, […], because we were like, look at this, did you know that this was supposed to be in there, and all of a sudden we had all these new understandings of the film and we were kind of interpreting the film on our own. The students conveyed a clear appreciation for the empowering nature of the archive whereby they were enabled and encouraged to make their own discoveries. [Student] To actually see these primary materials, it’s such a unique experience, because I’ve never had a chance to actually see a director’s notes on their first ideas of a film. [Student] I’m not a film major so going into it I didn’t really know what to look for, and I think what might have been helpful to me would have just been a list of all the tags for me to look at, and figure out what actually is up here. [Student] I kept trying to search within the script or within notes that you can only search like title there aren’t many tags there, so I had to go through and like read through the pages, it just got really tedious, so I don’t know if its possible for you to like search for words within the script. This comment highlights the known issue of the limitations of the searchability of the analogue source materials. Orlando was produced in 1992, in a period where documents had been type written. Where documents had been digitally produced, only the paper-based versions remained, and so were scanned in as image (and therefore not text searchable) files. [Student] What would have been really helpful for me if you had like the scene you’re looking at, that maybe surrounded by all the papers, the script for that scene, the call sheet for that scene, so like you could put right next to each other the clip and then all the physical papers. This comment reinforces the original intention of SP-ARK to have this capability built within the interface, as demonstrated in the prototype that was shown at the Media Festival Arts in 2010 (Sheppard, 2010). [Student] If the visuals could be bigger and more of a focal point, I think it would allow them to be more accessible to a student […] I think of when I go into iTunes, and I can see a huge album cover, or the cover of a DVD and the pictures the first thing I see and if I want more information on it the text comes afterwards. [Student] I didn’t know the specific tag to begin with, so when I was typing in dress or just things like, I was thinking about like Google, or costume or wardrobe, I think the proper tag is costumes, but because I left the ‘s’ off, it didn’t come up for me. These insights demonstrate the high expectations that the students had of the search functionality in its ability to present information visually as a result of their prior experiences with commercial examples such as Google and iTunes. When I asked the class to indicate whether the search box was the first method of searching that they applied, they all raised their hands. No one had used the taxonomy function to look for an item. [Student] I kind of think that a lot of the powers are the crowd sourcing power, I think if pathways really demonstrated its strongest point, this idea of letting anyone go in, pick out the smallest details and connect the dots, and I kind of think the idea of allowing user tags would almost open up like Wikipedia in a sense […] to allow users to go in there and play with it and allow users to jump off each other that’s when your going to get the multiplication factor where you have this rapidly expanding base of knowledge. [Student] In terms of the pathway itself, it was really great, that you can move it around, so its not just a linear pathway, because there were times when I had multiple examples, and it would have been nice to do a centre bubble, branching off with the multiple examples, and then something branching off there, and it would have been interesting to experiment with different structures of the pathway. · A social learning model was facilitated through the Pathway’s infrastructure, which stimulated the open sharing of ideas and practices. · To be able to work with the video content more creatively and fluidly, to be able to remix and adapt content. The SP-ARK archive provides a unique example of the successful marriage between the principles of open educational resources and open archives. Our findings as part of this archive project above could help to inform others working with primary resources, clearly highlighting the key benefits of digital preservation, presentation and access. Students emphasised the value of a digital archival model to facilitate the ability to simultaneously view source materials alongside more conventional archival materials. This proved to be extremely beneficial and empowering to the learning process. The only other known example of this model within the field is EVE (Everyone’s Virtual Exhibition) hosted by The Bill Douglas Centre Online Catalogue for the History of Cinema and Popular Culture at the University of Exeter (17) from which similar beneficial conclusions have been drawn. Through EVE’s online interface, users are able to convene their own online exhibition through the curation, annotation and presentation of artefacts, which can be published in the same way as a SP-ARK Pathway, to be made publicly visible to other users (see Prosser, 2005). SP-ARK raises important questions for both film studies and film production studies as disciplines. For example, how might the close analysis of film production processes that digital archives like it enable extend our understanding of cinema in ways that usefully move beyond the close textual analysis of the finished film? (18) Further extension of SP-ARK’s content and functionality are indeed currently being explored through a collaborative project entitled ‘The anatomy of a film production: Understanding the people, the roles, the processes and the careers on set of Sally Potter’s new film’ between myself at the University of Brighton and Potter’s production company AP. This project seeks to extend the reach of the archive into vocational and professionally based education. Film sets and feature film production processes tend to be closed and hidden from view, but are areas of extreme intrigue and interest, from the viewpoint of audiences, fans, would-be filmmakers, academics and teachers and those wanting to forge a career in the film industry. Potter’s latest film (yet to be titled) has just completed production, and during the process, key members of the production crew were furnished with portable Flip cameras to record their daily activities on set. The materials thus produced will create an interactive audiovisual ecology of the film production process, capturing all of the individual crewmembers’ contributions to the creation of the film through personal testimony, revealing working dynamics and practices within a contemporary location-based film production. The project registers all the roles on set from runners and caterers to camera, sound, costume, make-up, continuity, set builders, sparks, extras to heads of all the departments. It will extend the reach of the archive’s resources beyond the production phase into the postproduction, marketing and distribution of the film. This, in turn, will expand the role and functionality of SP-ARK as an invaluable and innovative open resource for young people and students seeking careers in the film industry, and to educators and academics teaching contemporary film production and processes. Will emerging technologies that facilitate the intuitive retrieval and mining of audiovisual archival materials, such as HTML5 video architecture, (19) provide digital archives like SP-ARK with new ways of presenting and navigating materials that move beyond the traditional database and archival rubrics? Further advice and support on these questions could be gleaned from user group communities around technologies such as Reel Surfer (20)and Popcorn, (21) an open source video platform developed by Mozilla. The BBC is currently developing an Application Programming Interface (API) within their Redux (22)initiative in order to facilitate the accessibility and search ability of their extensive archives, as are the British Film Institute. (23) The development of digital technologies and open source software, in particular in relation to the advancement of online video, provides a unique opportunity to semantically gather and present materials to audiences in new and open ways, which move beyond the traditional (closed) archival model. 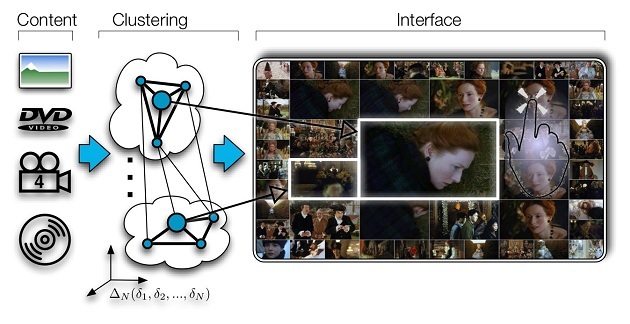 For example, Popcorn facilitates the real-time linking of data from video streams. These initiatives seek to draw out the benefits and efficiencies of collaborative resource generation, exploring the challenges of sustainability and expansion of both the resources and the encompassing user-group community. The findings of the SP-ARK case study, many of which are set out above, will not only inform the future direction of this pioneering archive itself, an endeavor which has always placed the educational community at the core of its development (initially at the Screen School at Goldsmith’s College, see Mayer: 2008). But they also have the potential to support and inform the approaches of other, emerging online film-based repositories as they grapple with the issues of openness, reuse and licensing. Whatever happens with future developments, the benefits that such resources are already bringing to higher-education academics and students are invaluable. The pathways tool lends itself to the critical and analytical study of primary materials for both undergraduate and postgraduate study within numerous disciplines. It also fosters a model of collaborative scholarship whereby ideas are shared and developed, which moves far beyond the traditional single-user archival model. The resource as a whole also has the potential to enhance and enrich teaching and learning practices within film and media disciplines, and beyond, as well as to encourage other high-profile filmmakers and organisations to allow online access to their work in the future. SP-ARK exemplifies the successful combination of an archive and an educational resource, providing an invaluable and compelling models for social and participatory learning, as well as for the development of open academic practice more generally. (1) Online at: http://www.sp-ark.org/, last accessed June 18, 2012. (2) Online at: http://www.wired.co.uk/news/archive/2011-10/14/bfi-search-film-archives, last accessed June 18, 2012. (3) Online at: http://bobnational.net/, last accessed June 18, 2012. (4) Online at: http://bufvc.ac.uk/, last accessed June 18, 2012. (5) Online at: http://www.euscreen.eu/, last accessed June 18, 2012. (6) Online at: http://www.europeana.eu/portal/, last accessed June 18, 2012. (7) The film can be viewed online at: http://www.youtube.com/watch?v=qMLf5mpifNc, last accessed June 18, 2012. (8) Online at: http://www.afc.ryukoku.ac.jp/Komon/kurosawa/index.html, last accessed June 18, 2012. (9) This license means that assets must be attributed, cannot be used for commercial purposes and cannot be altered, transformed or built upon. Online at: http://creativecommons.org/licenses/by-nc-nd/2.0/, last accessed June 18, 2012. (10) Potter’s 2009 film Rage was the first feature film to be launched and distributed on mobile phones. (11) The theme for the 2007 conference was Media in the Public Sphere. (12) Notes from interview conducted by SP-ARK in 2008. (13) The Visual Browser was originally developed as a result of a six-month Knowledge Transfer Project (KTP) with Essex and Surrey Universities supported by a government grant awarded by the Technology Strategy Board. The KTP saw the Essex University’s Department of Literature, Film and Theatre Studies and the University of Surrey’s Centre for Vision, Speech and Signal Processing working together to develop an image browsing interface for SP-ARK. This allows users to visually analyse the film’s original rushes, from single frames to complete shots, and incorporate these in their pathways. This has never before been possible with a film archive. SP-ARK’s new Visual Browser feature comprises of two modules: an image-clustering engine, that derives the underlying structure of the database, and a hierarchical interactive interface depicted in Figure 4. Full technical explications can be read in Ren, Sarvas and Ćalić (2010). The choice of the similarity metric (in the case of SP-ARK, it is colour values) is invariant to the type of clustering engine and/or the interface design, enabling generic application of this system to comparing other similarity metrics. Within SP-ARK’s visual browser, a chi-square distance between three-dimensional RGB colour histograms was utilized as the similarity measure. The shots were represented by a set of key-frames efficiently extracted using a method for video summarisation introduced by Ćalić et.al (2007). (14) A ‘flat file’ is a digital database file containing records that have no structured interrelationship. (15) See Figure 2. This conforms with the sequential categories of the film production process; Development, Preproduction, Production, Postproduction, Finished Film and Distribution. (16) These become clickable links when the asset is displayed within the archival interface. (17) http://billdouglas.ex.ac.uk/eve/search.asp, last accessed June 18, 2012. (18) The paratextual study of the ephemera relating to film production is a fast emerging academic area (see Genette, 1997 and Gray, 2010) that my article seeks to advance. (19) See also Patricia Aufderheide’s discussion of this technology and its applications elsewhere in this issue of Frames. (20) http://reelsurfer.com/, last accessed June 18, 2012. (21) http://mozillapopcorn.org/, last accessed June 18, 2012. (22) http://www.bbc.co.uk/blogs/bbcinternet/2012/04/connected_studio_launch_backstage.html, last accessed June 18, 2012. (23) http://www.wired.co.uk/news/archive/2011-10/14/bfi-search-film-archives, last accessed June 18, 2012. Ćalić, J., Gibson, D., Campbell, N., Efficient Layout of Comic-Like Video Summaries. IEEE Transactions on Circuits and Systems for Video Technology, 17(7). ISSN 1051-8215, pp. 931–936. 2007. DCMS SMITH, R. H. L. 2012. A Future For British Film, It begins with the audience… A UK film policy review. London: Department for Culture, Media and Sport. Print. Fowler, C. 2009. Sally Potter, Urbana, University of Illinois Press. Frenkel, V. 2011. Capture and Loss: Memory, Media, Archive. Public, 163-169. Gagon, J. 2011. The time of the audiovisual and multimedia archive. Public, 59-63. Genette, G. 1997. Paratexts: Thresholds of Interpretation, Cambridge, Cambridge University Press. Gerhardt, P., and P.B. Kaufman. Film and Sound in Higher and Further Education: A Progress Report with Ten Strategic Recommendations: HEFCE/JISC, 2011. Print. Gray, J. 2010. Show Sold Separately: Promos, Spoilers and Other Media Paratexts, New York, New York University Press. Kurosawa, A. Online Film Archive, [online] http://www.afc.ryukoku.ac.jp/Komon/kurosawa/index.html. Accessed 15/12/11. Mayer, S. Expanding the frame: Sally Potter’s digital histories and archival futures in Screen 49:2 Summer 2008. Print. Mayer, S. 2009. The Cinema of Sally Potter: A Politics of Love, London: Wallflower. Prosser, D. (2005) Reflections on the use of EVE in Higher Education, April 2005, [online] at: http://billdouglas.ex.ac.uk/eve/eve_ped_use.pdf, last accessed 18/06/12. Ren, K., Sarvas, R. and Ćalić, J. Interactive search and browsing interface for large-scale visual repositories in Multimedia Tools and Applications, Volume 49, Number 3, September 2010, pp.513-528. Features an overview of the original SP-ARK WordPress Site, in addition to clips from her films and documentary footage of working online with Yes. Online at: http://www.mefeedia.com/watch/47266737, last accessed June 18, 2011. The SP-ARK team worked with students at Goldsmiths College to show how the pathway concept of SP-ARK will work. 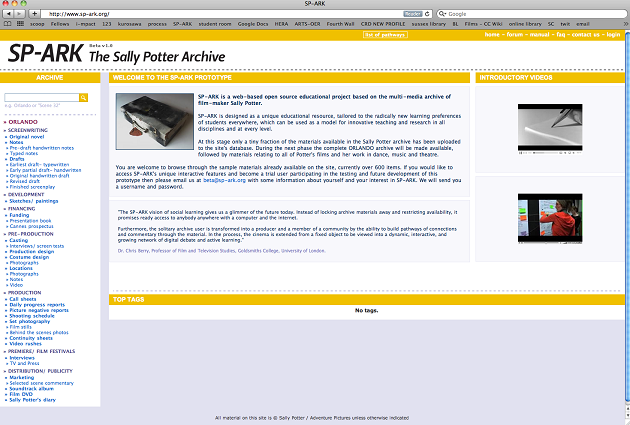 Online at: http://blip.tv/sallypottercom/sp-ark-a-workshop-at-goldsmith-s-college-351099, last accessed June 18, 2011. Presentation by Christopher Sheppard at the Media Festival Arts, London, 10th September, 2010. Online at: http://www.mefeedia.com/watch/47266733, last accessed June 18, 2011. Frames # 1 Film and Moving Image Studies Re-Born Digital? 2012-07-02, this article © Sarah Atkinson. This article has been blind peer-reviewed.